Your Rackspace cloud configuration is backed by the physical infrastructure in our data centers. Cloud Servers provides computing power. Cloud Networks creates an internal network of cloud servers. Cloud Block Storage emulates a removable disk, which can be transferred from one cloud server to another. Cloud Images preserves a consistent starting point for new Cloud Servers instances. Cloud Files provides long-term storage for an unlimited number of objects. Additional services enable specific activities such as user authentication, load balancing, and event monitoring. 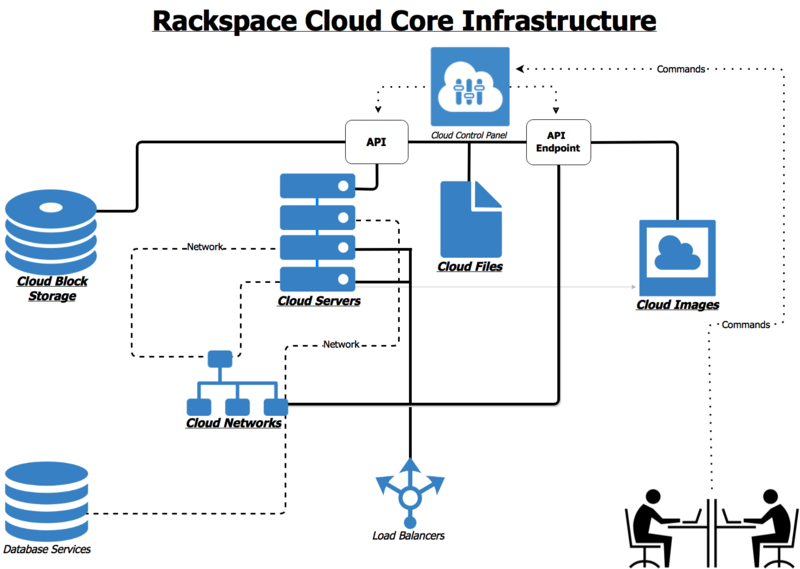 Cloud Servers, Cloud Networks, Cloud Images, Cloud Block Storage, and Cloud Files are the Rackspace cloud's core infrastructure. From the Cloud Control Panel, you can send a request to the API for a cloud service. The service processes your request.